Inder Loves Folk Art: Smocking. Readers, I know that you, at any rate, will understand this: I have less time for sewing and crafting than ever, so of course I am absolutely brimming with ideas and inspiration. My latest obsession? Smocking. I want to learn how! So I bought this pattern for a simple bishop dress off of Etsy. Isn't it pretty? Looking through "vintage" (crap, am I vintage now?) 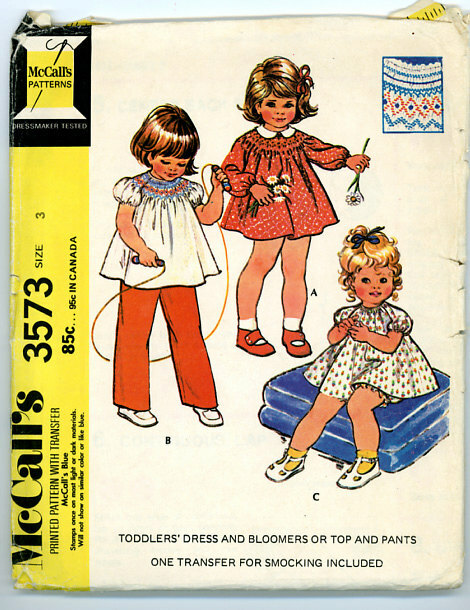 children's patterns from the 1970s and early 1980s ... it is such a "happy place" for me. Remembering the dresses my mother and grandmother sewed for me when I was a little girl, and the styles I coveted at the time. (Holly Hobby! Gunne Sax! Laura Ashley! I was really into ruffles and frills as a girl.) Warm, happy feelings. It's all I can do not to buy heaps of patterns! So I've been spending my lunch hours at work reading smocking tutorials on the internet, surfing Etsy for vintage smocked dress patterns, and day-dreaming visions of pretty peasant dresses for Miss Maggie. Do you use crafts as an escape from the pressures of "real life"? I know I do. I totally wore a little outfit like that as a kid! adorable! hope you figure it out! Yes, me too! I think that's why I love it so much! Craft as an escape? Most definitely! I know, it's making me want to make flared pants for Maggie! Too fun! I am an avid smocker and am so excited that you're getting into it! If you're planning on getting into it in earnest, treat yourself to a smocking pleater! I am looking forward to seeing what you'll make. (the pattern includes bloomers!!) also why haven't you treated your readers to the creepy smocked fish???? Creepy smocked fish?! You must share! I also look forward to seeing what else you create on your smocking adventure. I definitely craft as an escape. I totally am with you on this one. smocking is on my 'would love to do it'list and yes...daydreaming of craft projects is a nice escape from dirty diapers, sippy cups and laundry mountains. Oh, my grandmother used to make me so many lovely little smocked dresses when I was little. I love the look! It is so "vintage" haha it is funny to think of it that way.... ;) Oh a smocked peasant dress does sound lovely! Smocking was still really popular and common when we were children. What happened? I'm surprised it hasn't been revitalized by more "modern" sewers ... Well, maybe it's about time! love smocked dresses, and your enthusiasm! just go for it, its always fun :) yay for learning new things! I was thinking of this as a math equation: My enthusiasm for a project is inversely proportional to the practicality of the project and the time I have to create it. Impractical sewing is the best.